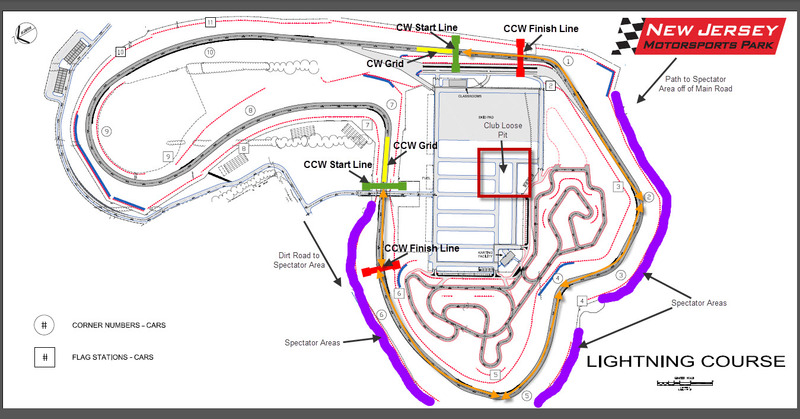 Here is the course layout and other relevant areas for the event this weekend at NJMP. We will be using part of the Lightning Course for drifting, the Rallycross will be using the other part of the track. We will run both clockwise (normal race direction) and counterclockwise (reverse race direction). The start lines for each direction are marked on the map. The finish lines for each direction are also marked. We will start with all cars at one of the starts. All cars will run through the course and line up at the other start. So the finish lines are the stop drifting immediately mark on the track. This is for safety and will be covered in more detail at the driver’s meeting. The Club Loose pit area is also marked on the map. So when you get there, if you are driving, you know where you can set up. Remember to bring a piece of plywood or similar to put down on the asphalt for jacking up the cars. NJMP does not want their pavement to get messed up from jacks and jack stands, so we need to make sure we follow this. Or you will be stuck jacking up the car in the grass. Spectator areas are marked on the map. These are spots that we didn’t know we could go the last time we were there. You can see a lot of the course from different parts of these sections. They are accessible by dirt road and by a clearing in the woods. You can bring your car or truck out there assuming it can make it through the path to get there. This would be the best place to spectate. You can also walk over there and wander around so you can see all of the different sections of the track. There aren’t too many places that you can see much from the pit area, so I definitely suggest heading out to the marked areas to get a much better view of what is going on. Remember, registration to drive ends today. And if you are coming to spectate, head over to NJMP’s site and purchase tickets today to save some money. $30 for a carload of up to 6 dudes is an awesome deal but you need to purchase that ticket today otherwise it could cost you $20 per person. And remember, there is a bunch of other stuff going on at the track this weekend. So bring your friends and family out to the track, there will be something for everyone. You can watch some drifting, then check out the rallycross, maybe do some gokarting or get into any of the other things that NJMP will have set up on Saturday.